Above: Lyndhurst (left) and Ashe (right), 'villas' built by the Ashburton Building Company. This photograph circa 1911. In March 1890 the Portreeve, John Down, presided over a committee meeting of the Ashburton Improvement Society, which adopted a scheme for a building company in the town. Many of the 500 shares of £5 each were taken up at the meeting. On Monday, 14th July 1890 in the Market Hall, shareholders in the new venture, called The Ashburton Building Company, held their first meeting. (Western Times 16 Jul 1890 p 2 col 3) The Chairman of the directors was Mr F Amery – almost certainly Peter Fabyan Sparke Amery - his brother John Sparke Amery was also present. These brothers were landowners, and P F S Amery was a JP for the county. It seems likely that they were the prime movers behind the new enterprise, as the first resolution was to accept the plans of Mr Rowell of Newton Abbot to build near Rew on the Druid Estate – which the Amery family owned. Other shareholders included the Portreeve Mr John Down, Dr Ackerley, E Windeatt, E Tucker, H Stevens, S Yolland, G C Foot, J Bickford, and C J Jeffery. Mr R C Tucker was elected as auditor, and the Secretary was Mr S Tozer. As well as the members of the Ashburton Institute and the Ashburton Mutual Improvement Society, all the Ashburton men would have known each other merely by living in the same town – and there were additional professional links, with three solicitors involved, and two bank managers. J F Baker, probably Joseph F Baker, Commercial clerk – employee, 1891 census. (Western Times 8 Sep 1890 p2 col 4), and a month after that the tender of Mr J Pomeroy, builder, was accepted for building two villas near Rew Down Cross. Mr Pomeroy's tender was the cheapest of the three, proposing to build villa no 1 for £507 8s 6d and villa no 2 for £510 10s. 4 houses were to be built, with at least £500 spent on each. None of them was to be used as an inn or a public house. 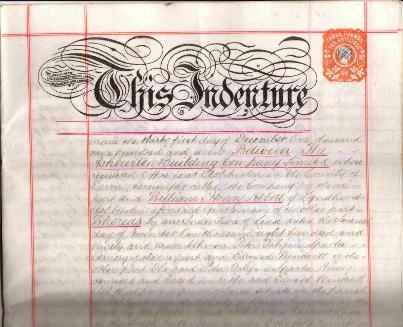 A later indenture refers to an indenture dated 6th February 1891, made between Edward Windeatt of the first part and 'The company' of the other part. 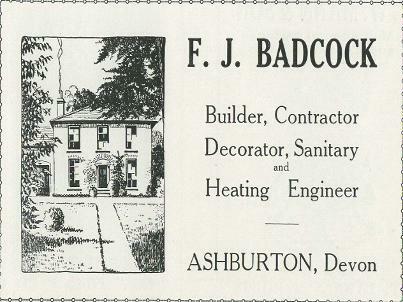 This 'company' was the Ashburton Building Company. Indenture 11th November 1890 and indenture 23rd December 1907 amongst the deeds of Cartlands. Many thanks to the owner for allowing me to see these. Who was J Birch, and what was he champion of ? His eldest son, John T Birch, was probably the boy aged 10, son of Joseph Burch, who was involved in an accident the previous year. He had fallen from scaffolding at the Conservative Club, and was taken to his home in North Street: he was unconscious for several hours. It seems highly probable that Joseph was a member of one of Devon's volunteer army corps. These had begun in 1859, as a result of 'Her Majesty's Government having had under consideration the propriety of permitting the formation of volunteer rifle corps...'. In 1891 the Devon County Volunteers Association held an annual shooting contest. The Class F Association Challenge Cup was won by Pte J Burch, Ashburton, who received a 'Plate and £7'. It seems highly probable that this is the plasterer working on Moorlawn. Although he was perhaps stretching the truth a bit to claim to be Champion of Devon, he was certainly one of the winners. 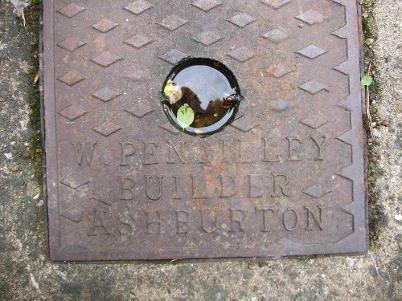 Right: An original drain cover from Claremont (now Cartlands) supplied by W Pengilley, Builder, Ashburton. 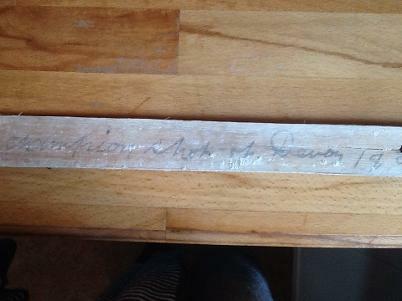 Thanks to Roger Tilley for permission to photograph this item. A William Pengilly is shown on the 1891 census, living with his wife and family at West Street, 'Greengrocer'. His occupation is shown as Market Gardener. Kelly's Directory for 1902 has William Pengilly, Builder and greengrocer, West Street. By 1893 one of the first two villas was let (Western Times 3 Aug 1893 p2 col 3): this seems to have been the original intention for all the houses built by the company – they were 'Build-to-let', rather than being sold off when completed. At the annual general meeting, a few months later, shareholders had probably lost some of their initial enthusiasm – some apparently did not even come to the meeting, as the Exeter and Plymouth Gazette reported that there was 'A fair attendance'. The Chairman of Directors F Amery explained that owing to a 'general depression in the letting of villas', there was still one without a tenant. He added that “Great inconvenience had been caused by the Sanitary Authority's 'imperfect manner' in laying water to the property. Receipts were £742. 17s payments £86. 12s: the balance due to bank on 1 Jan 1894 was £656. 4s 7d. *J S Amery was on the Parochial Sanitary Committee in May 1893 - also Dr Ackerley and S Yolland. By 1901, if not before, the company was paying a dividend - at the annual general meeting the receipts were £76, and disbursements £51 - of which £24 was in dividend. In 1902 another dividend was declared, and the tone of the meeting sounded more optimistic than in the early years – the reports and accounts were 'of a favourable character'. Receipts were £56, expenditure £54, and a dividend of 1s 6d per share was declared. The balance carried forward was £27. An ordinance survey map of 1905, Devonshire sheet CV111.15, shows Moorlawn and Claremont at Rew Down Cross. In 1905 the Secretary stated that 'the houses were much in demand', and 'the machinery of the Company should be utilised for further building operations'. After discussion it was resolved that the directors devise means to raise capital and build more houses. Western Times 10 Mar 1905 p13 col 1. They seem to have been successful, as in 1906 Mr R Montague Luke, civil engineer and architect of Princess Square, Plymouth, won a contract for designing new villas and laying out the Druid Estate. At the annual general meeting two weeks later 'the plans for the new villas were greatly approved of', and it was hoped that work would soon begin. A dividend of 2s 6d per share was declared. By the following year, 1907, the company was in the red by £2 2s 8d. This may have been because of expenditure on two new semi-detached villas that were in the process of construction. 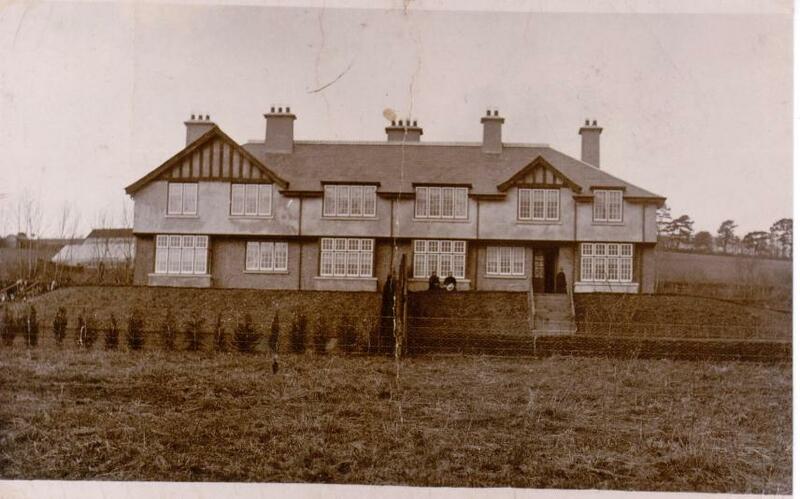 There was probably some relief that the Sanitary and water committee recommended that the villas Ash and Lyndhurst be granted certificates of occupation. Indenture 23rd December 1907 amongst the deeds of Cartlands. Many thanks to the owner for allowing me to see these. Left: The deeds to Lyndhurst. Dated 31 December 1907, William Henry Abbott originally leased the property from the Ashburton Building Company. On March 3rd of the following year Mr Abbott bought the freehold from John Sparke Amery for a consideration of £60. The lane leading to the Rew Down Cross properties was at that time called Stone Carriers' Lane - later changed to Druid's Lane. Right: F J Badcock, builder, Ashburton, provided the drain covers for Lyndhurst. In 1911 Frank J Badcock, with wife and a six year old Frank J Badcock, was a building labourer. His father, George James Badcock, (died 1898), had been a stone mason. See also Hugh Abbott's memories of living at Lyndhurst in the 1940s, in the Growing up in Ashburton section. Information from the deeds of Cartlands. Many thanks to the owner for allowing me to see these. With Mr Abbott on the brink of leasing one of the 'villas', the company turned its attention to a field in Dolbeare Road. They applied to the Sanitary and water committee asking what the conditions were for water and gas to be supplied there, where they proposed to erect two villas. The Surveyor estimated the cost to be £130, and it was suggested that the company should pay £75 towards it. The committee also recommended that an offer of £106 be made towards claims of £146 in compensation for the laying of low level sewers through various properties. Mr Sawdye wanted to know how the figures had been arrived at, and it was agreed to go to committee on the matter. On April 19th 1922 Lieut.-Col Sir Alfred Pearce Gould KCVO died at Ashe. An eminent surgeon and the author of several books on surgery, he spent most of his time in London - however he was a Justice of the Peace for Devon, and for many years had been the president of the Ashburton and Buckfastleigh Cottage Hospital. 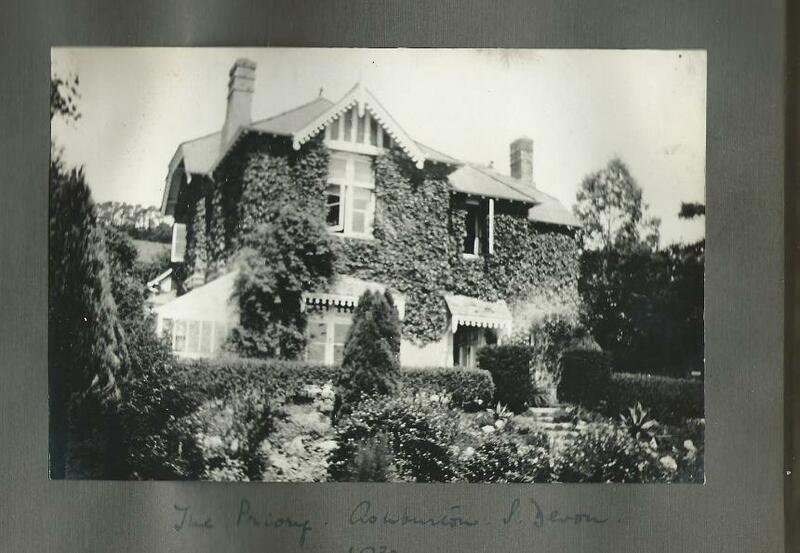 In 1932 at a meeting of the Ashburton Urban District Council, the Public Health Committee made a recommendation regarding the collection of refuse from The Priory and neighbouring houses. The offer should, they said, be the same as that made to Miss Manlove of Moorlawn, ie that refuse be collected from Lurgecombe Cross once a month. Above: The Priory in 1932, also known as Claremont and Cartlands. In 1913, as the world edged closer to war, the annual general meeting stated that the company's property had been maintained well, and improvements to the entrances of the villas had been carried out at cost to the lessees. The position of the company was, said the Chairman, 'favourable', and a dividend of 2s per share was declared. The first World War, 1914 to 1918, brought building to a halt, and by the early 1920s there was a deteriorating economic climate. J F Baker presided at the annual general meeting of 1923, where the accounts showed that receipts were £79, and payments were £87 4s 4d. The last villa had been sold, but as there was no prospect of building again on a profitable basis, the meeting recommended that the company be wound up and the assets distributed. A resolution to liquidate the company was carried, and an extraordinary meeting was fixed for April 13th. J S Amery, J Barnes and W H Huddy were re-elected. 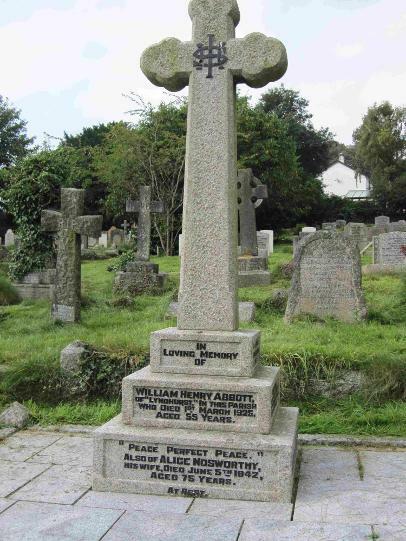 Above: Memorial to William Henry Abbott, 'of Lyndhurst' who died in March 1925 aged 55. This is how the story goes. As you might expect, the materials for the houses were conveyed to the building sites by horse and cart, and in particular a cart pulled by two horses who may, or may not, have been called Prancer and Dancer. The horses would plod up the hill, the cart would be unloaded, they would then plod down to the town again, and the whole process would be repeated. ......and so took the materials on their own to where they were supposed to be. In 1880 Joseph Easterbrook was fined 18s for leaving his horse and cart outside the Red Lion Inn. In 1903 Frank Coleman, employed by coal merchant T W Mann, was fined 8s for leaving a horse and waggon without proper control.